ESPN’s recent 30 for 30 special, “I Hate Christian Laettner,” looks at the subject’s controversial time as a standout basketball player for the Duke Blue Devils. Laettner was despised by many basketball fans because of the way he played the game, including one incident where he stepped on a University of Kentucky Basketball player. The documentary describes how Laettner bullied not only the opposition, but his own teammates. And where does the documentary say he learned such behavior? His older brother. A University of Nebraska-Lincoln study gives a detailed look at bullying from siblings the Journal of Family Violence. The researchers talked to 400 undergraduates and found that students said they were bullied more by their siblings than by other children. Last year, another study conducted by the University of New Hampshire discovered that 32 percent of children who said they were victimized by a brother or sister reported higher rates of mental-health issues. Lisa Elliott, Ph.D., clinic manager of Cook Children's Behavioral Health in Denton, Texas, said she has seen several kids lately in her office dealing with problems related to siblings. 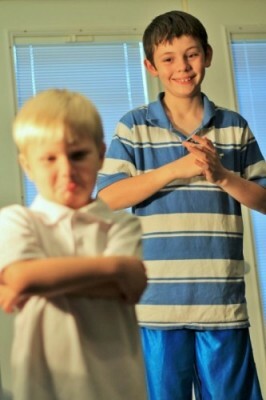 Elliott, a licensed psychologist, said this goes beyond sibling rivalry or teasing. She is seeing abuse and parents need to be aware of the role they play in this issue. Especially if they are favoring one child over the other. Often times that "favored" child becomes the bully. A study published in the journal, Pediatrics, showed that kids who had been bullied by their brothers or sisters for a prolonged period of time were twice as likely to report being clinically depressed when they grew up. "I certainly think in most families there is likely to be some level of conflict or disagreements among siblings at different times," said Joy Crabtree, a licensed psychologist at Cook Children's Southlake Urgent Care and Pediatric Specialties. "However, I think parents need to be aware of when it may be crossing a line, such as physical altercations, repeated name calling or degrading of a sibling etc. Sometimes it can happen out of ear shot of the parents so it’s important to talk about everyone maintaining respectful communication in the family. If a child feels uncomfortable or targeted, he or she needs to let mom or dad know because it may not be happening in front of the parent. If targeting is occurring, limits and boundaries need to be set so a negative pattern does not continue." Research conducted by the Universities of Oxford, Warwick, Bristol and University of College London said that bullying among siblings is particularly upsetting because these children have no way out. Bullying includes persistent verbal or physical abuses, as well as just ignoring the other siblings for long periods of time. All physical bullying needs to be addressed immediately and not tolerated. If a child is feeling inferior help, build that child’s self-esteem. If you are inadvertently showing what is perceived to be favoritism by one child, modify your behavior and be sure to praise each child equally with positive behavioral anchors. Don’t label your children as the “bright one”, the “musical one” etc. Finally, it is critical to teach your children how to problem-solve conflict effectively and how to have empathy for others.